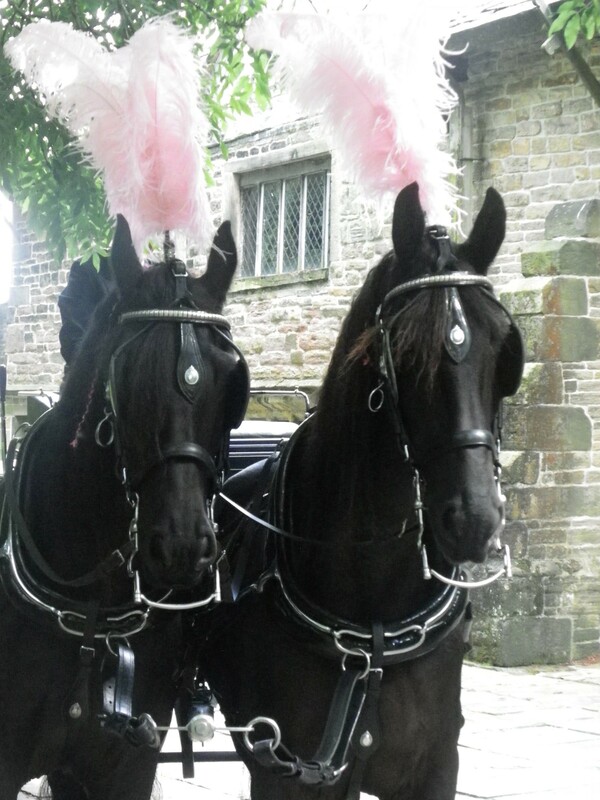 Whether you are celebrating a special birthday, a romantic anniversary or a memorable milestone, a horse-drawn carriage is the ideal way to add a magical touch to the occasion. 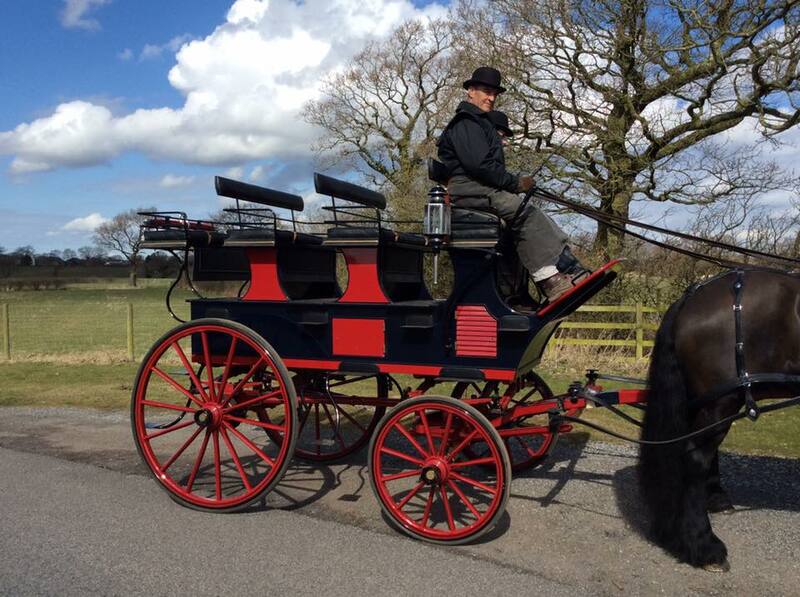 Our carriages are available to hire for short excursions throughout Lancashire and the North West. Be it a leisurely outing in the countryside or a traditional pub crawl, we have you covered. 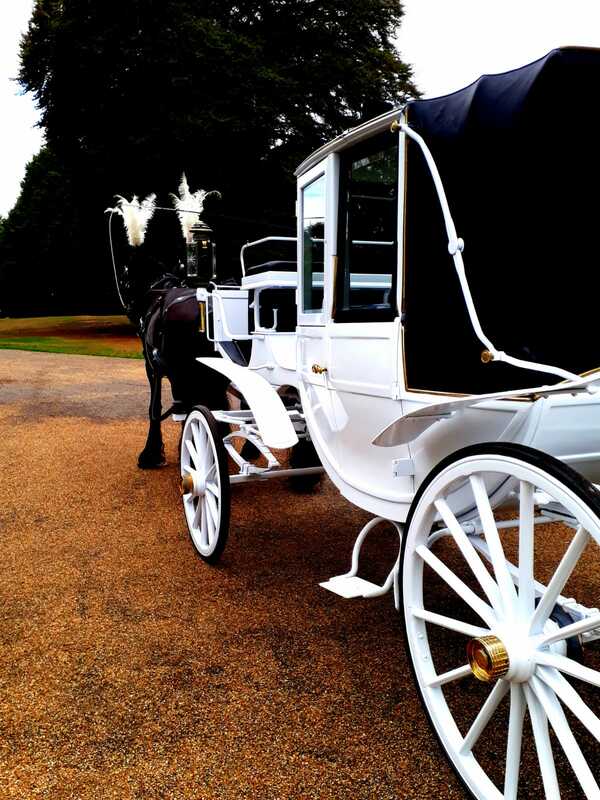 Elegant Carriages have a fleet of carriages available to hire for any occasion you can imagine. 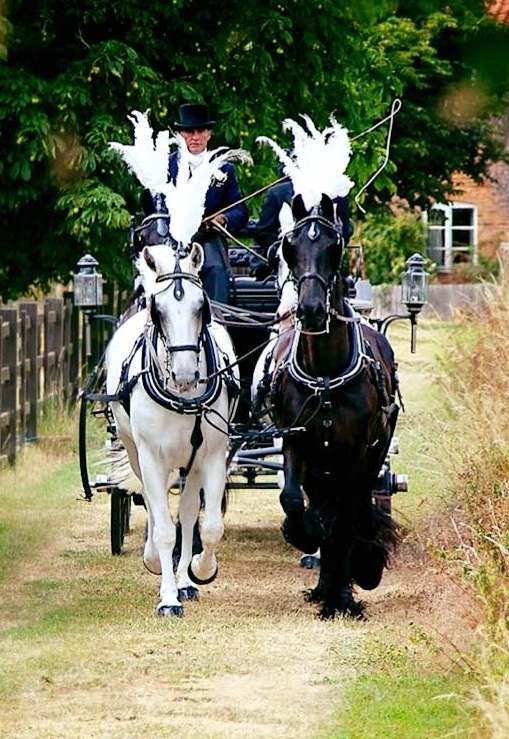 Our Landau carriages are available in midnight black or dazzling white, and each can be decorated with ribbons or flowers of your choice to add a personalised touch to your day (please note that flowers are an additional cost). The convertible roof is ideal to take advantage of or shelter from the ever-changing British weather. For a more intimate celebration, our navy Victoria carriage is perfect for romantic surprises. It seats up to 2 people- perfect for sweeping your partner off their feet and whisking them away to a mystery location. Though we must point out that although this carriage has a collapsible hood, the front is entirely open to the elements. On the other end of the scale, our Roof Seat Break is fantastic for holding larger celebrations. This spacious carriage accommodates up to 8 adults and has been dubbed our designated "pub crawl vehicle", but of course you can hire it for any occasion of your choice. This smart red and blue carriage features its own chiller and mini bar-top to pour drinks. 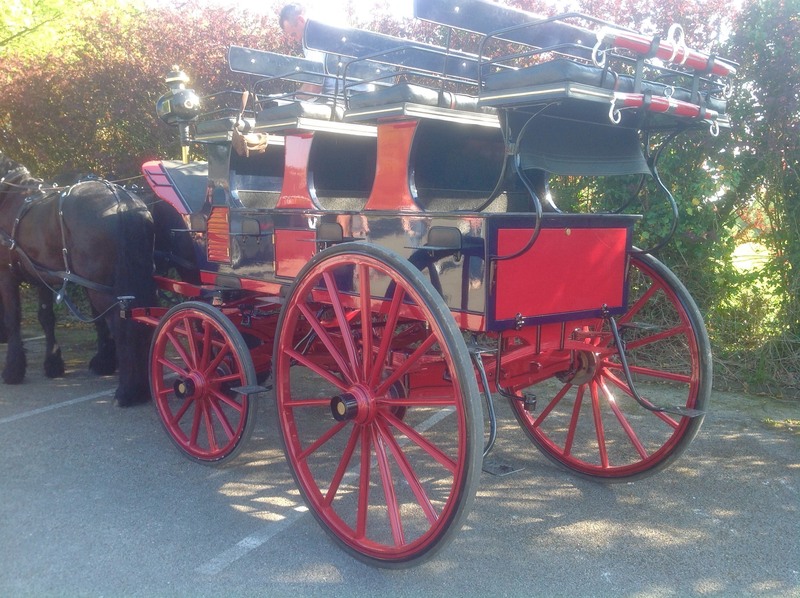 If you are hiring this carriage for a pub crawl, rest assured that our professional coachmen will not be drink-driving. 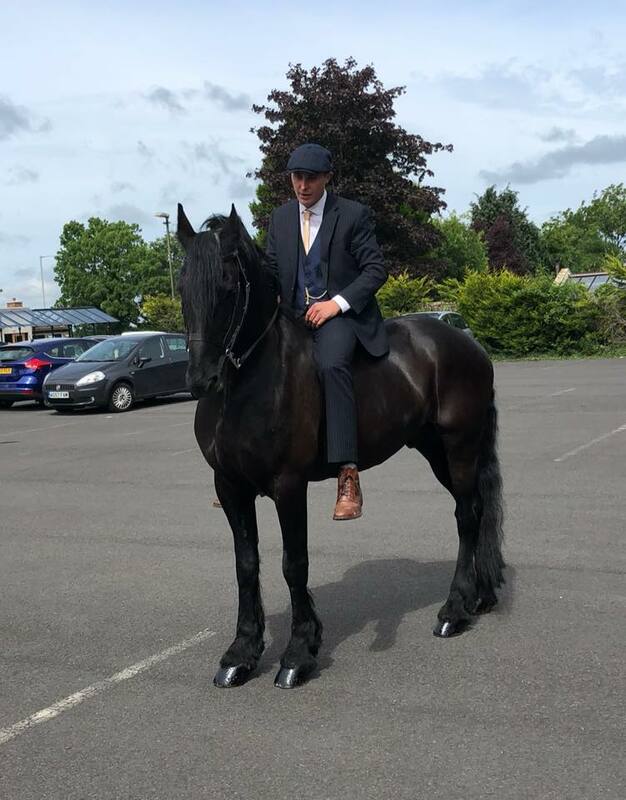 If you are hosting a special event, Elegant Carriages are proud to present our very own Thomas Shelby look-a-like to greet your guests at the entrance- Peaky Blinders style! All of the above carriages can be pulled by either a pair (2) or a team of 4 horses, perhaps with the exception of the Victoria carriage which is lightweight in comparison. You are free to choose from exclusive teams of elegant white Irish Sport horses or majestic black Friesians. Alternatively, you can have a "domino" team which is a mixture of the two. The hire is inclusive of our fully-qualified coachmen. I am planning a surprise, can you help me? Of course! We love surprises at Elegant Carriages; although we aren't a professional planning company, we will be more than happy to cooperate with your plans, such as hiding around the corner until a given signal. Please contact us to discuss the details of your arrangements. Can we pet the horses? Although our horses are very mild tempered and used to being handled, they are animals with a mind (and moods) of their own. 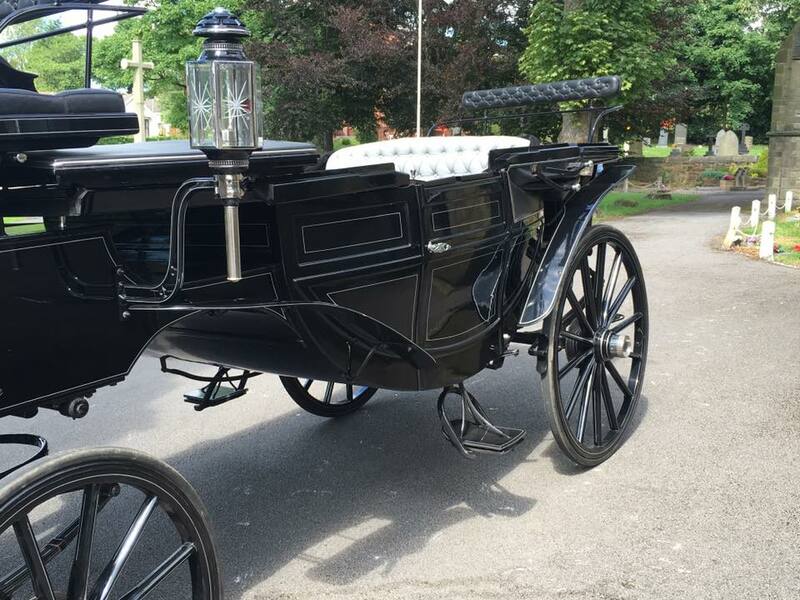 It's advisable that you ask the coachmen before you touch the horses. Can you dress the horses for my occasion? We are proud to have the North West's largest collection of horse plumes (the feather headdress) in almost any colour and styles imaginable. If you don't find anything you like, they are available to order with advanced notice. 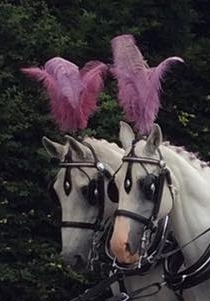 For something extra magical, you can even arrange to have your carriage drawn by a pair of white unicorns!